I came across this recipe in a Coles magazine and just couldn't wait to give it a try. 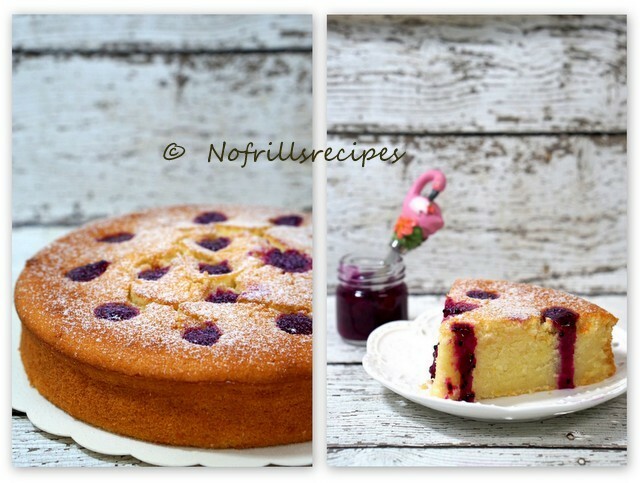 Instead of blueberry sauce I used dragon fruit to make the sauce as I was confident that the purplish colour of the dragon fruit would also stand out in this cake. And I was not wrong! Mash up the dragon fruit in a small sauce pan, add in the sugar and cook on medium heat till sugar has dissolved. Add in cornflour mixture and cook till thicken. Cool slightly. 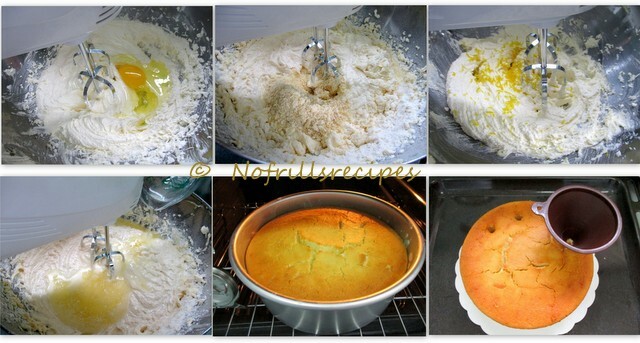 While still warm, pour mixture into each of the hole in the cake. Line the base and grease the sides of an 8 inch springform pan. Set aside. Beat the butter with sugar till light and creamy. Add in eggs one @ a time, followed by yoghurt, mix well. Add in sifted flour and almond meal to combine. Spoon the mixture into the prepared pan and level the surface. Bake in a preheated oven @ 180 deg for 45 to 50 mins. till golden brown. Test with a skewer till it comes out clean. Let cake cool in pan for a while. Using the end of a funnel, pierce the warm cake @ 3 cm intervals. Spoon 2/3 of warm dragon fruit filling into each hole and gently push the filling to the bottom of the hole. Set aside to cool completely. Dust with icing sugar before slicing to serve. Note : Instead of a funnel you can use the end of a clean wooden spoon to poke holes in the cake.